In this game-improvement iron, PING engineers put a high priority on power and forgiveness by leveraging the advantages of a hollow-body design and a thin, maraging steel face, creating PING’s longest, highest-flying iron to date. All this comes with the added benefits of playability, tighter dispersion and enhanced sound in a slim, aesthetically pleasing shape. Powerful Design The hollow-body construction of the 17-4 stainless steel head allows for an internal geometry design that positions weight away from the face, creating a frame for metal-wood-like flexing and high COR to greatly increase ball speed for launching the ball higher and farther. 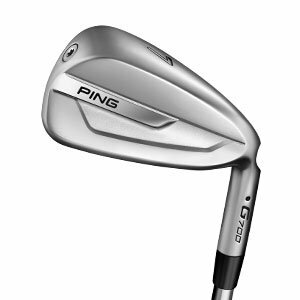 Maraging Steel Face One of the strongest alloys in the world, C300 maraging steel increases ball speed and distance by generating twice the face flexing. Low and extreme heel-toe perimeter weighting ensures high inertia and tightens dispersion. Clean Appearance With a sole width and offset similar to the G400 iron, plus a clean cavity, hydropearl plating and polished accent, the address view is confidence inspiring. Forgiving Sole Sole width, bounce and offset allow for better turf interaction to improve ball striking, which contributes to forgiveness and distance control without sacrificing playability and height.